So yesterday was sadly the last day of this years jazz festival. We managed to get into town in town to catch the first act, Sax Assault, featuring a nine piece saxophone section including 'Sir' John Helliwell from Supertramp amongst other notable players. Good strong horn lines were to be expected and were duly delivered with strong direction from the main man, Andy Scott. Really great stuff and a good start to the day even if we didn't manage to get a seat. Amazingly the weather was sunny and the seating area was packed by the time we got there. We missed the next act but came back for Vibration Music Society featuring Eryl Roberts on drums and my guitar tutor, Mike Walker on guitar. I'd already checked out their MySpace so I knew it was likely to be good one. The local jazz guitar fraternity were there in force - I spotted Jim Faulkner, Nick Mellor and Paul Farr for starters. Eryl was a bit shy about announcing the tracks which made it feel a little impersonal at first but it was great stuff when they got going. My favorite was the track '364A', a Soft Machine style bluesy workout. 364A is the house number of one the band members apparently. We got the CD - highly recommended. The finale in the square was 'Soul Daddy' featuring our friend the phenomenal Cinematic Orchestra drummer Luke Flowers and Steve Brown on keys. I haven't seen Luke play for a little while as he's been away on tour with the CO so it was fab to catch him. He was on great form and really kicking with some tasty funk grooves that I haven't really heard him play before. The Soul Daddy set was very enjoyable collection of own material and covers very much in the classic funk and soul vein. Probably not the sort of thing I'd go and buy but great fun to swing your pants to nontheless. The final gig of the festival was over at Matt and Phred's - The Myke Wilson Trio and Stuart McCallum Quartet. Gigs at M&P normally start at 10pm so I was caught out and missed the 8.30 start. They did carry on to do another 3 sets so I caught the 3rd and 4th from about 10.30pm. Stuart was on good form both playing and with his inter song banter that was quite witty. It's good to see him confident like this as he's normally quite a quiet bloke. Some of the solo CD tracks such as 'Rain Cycle' were nicely delivered with the addition of Finn Peters on flute and saxophone. I hadn't come across Finn before, a London based player and part of the Fire Collective. A really great player. The gig had a really nice Manchester jazz community feel. Chatted to Stuart's sister Jo McCallum, Lucy Howells from the The Music Place, Jon Cervantes, Luke Flowers and Steve Brown at various points during the evening. Most of the mcr jazz posse were in attendance. Well another fab festival over. I'm determined to get my act together and put something in for next years festival. Whether it gets accepted is another matter but it'll be an achievement to at least put something in. Must get back out on the jam scene as well as I've really let that slip this year. 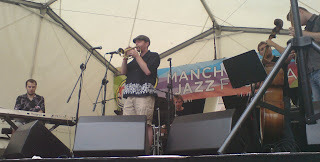 A full day of MCR jazz yesterday began with the Matt Halsall Sextet at 11.45am. We almost didn't go to see them but I'm really pleased we did as they were possibly the highlight of the festival so far for me. Pretty much spot on the sort of jazz I like the most this - simple two or three chord modal sequences with great melodies and horn arrangements for the heads. Most of the tunes were Matt's originals and I was really impressed with the writing. It made me feel really inspiring to go off and do some writing myself. The flute and tenor sax player, Roger Wickham was someone I've jammed with a number of times at the Po Na Na bar jams last year but I didn't actually know his name. The band also had MCR stalwarts John Ellis and Ed Kainyek providing some great keys and sax. Next up was Andy Schofield and Les Chisnall with an intimate gig in the Cross Street Chapel. The venue was very small and packed with people having to sit on the floor in the aisles and in front of the seating. It was great to hear Les playing in such a small setting. Les is a regular tutor on the Music Place jazz summer schools and I've heard him doing some stunning solo piano improvisations during the workshop but it's rare to hear him doing this sort of thing publicly. Although the tune heads weren't improvised on the spot we did get to hear some of Les' gorgeous quiet contemplative improvisations during the pieces. Andy also has a great touch that came across really well in this setting. In the evening we went to The Green Room for the 'Norma Winstone and Friends' concert. Again it was sold out and absolutely rammed. Consequently it was really hot in there and I was feeling a little light headed at times. It was my first chance to see Nikki Iles on piano, another well established UK jazz player. I'm not that familiar with Norma's material so I wasn't sure what to expect. The quality of playing was of a high standard and the delivery relaxed and assured. However I'm not sure this overall style of jazz is quite my thing. It was nice to see it in a live setting and it was worth going. Mike Walker on guitar can always be relied upon for some tasteful solos. I don't really know why, but I can't seem to quite hack improvised jazz singing. Maybe it's a hangover from the 'Crazy Days and Lazy Nights' Fast Show sketch. We have some friends, Frank and Moira, visiting us at the moment so last night we took them along to see Jon Thorne's tribute to bass player Danny Thompson at the RNCM. 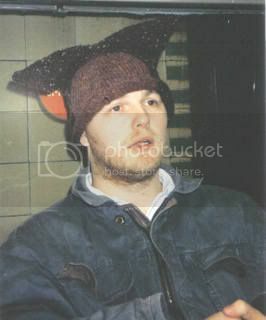 I've seen Jon several times and have a copy of his excellent Oedipus Complex CD, 'Manchester Road'. Generally speaking Jon's music is quite accessible and I know of Danny Thompson's playing with Kate Bush and with an all time fave of mine, David Sylvian, so I was expecting quite a 'melodic' gig. The set was in two halves with the first half being a quartet covering some of Danny's material and the latter Jon's commissioned piece for the festival, 'Watching the Well' named after Danny's contribution to Sylvian's song 'The Ink in the Well' that was a major inspiration for Jon picking up the double bass. The first half turned out to be some of the most free and avant-garde jazz I've heard at the festival and was quite hard going much of the time to tell the truth. This wasn't helped by the somewhat echoey and indistinct sound in the RNCM hall. The slightly mad saxophonist Gilad Atzmon was in attendance providing some suitably intense horn playing. I don't think it was the ideal start for our non-jazz fan friends who had been promised a fairly accessible gig. The latter half was a much easier ride with some quite moving contemplative and almost classical pieces. Jon was conducting with Danny Thompson on double bass and the addition of strings, harp and vocals to the quartet. Jon described it as the most special concert he'd ever done and it was clearly a very personal and moving experience for him. It was touching to be part of that and I'm very glad we went along. He also paid tribute to Manchester and the nurturing environment that exists for musicians. It feels great for me to be part of this now and I have found also that almost everyone is positive and welcoming. This is quite different to my memories of the London indie 'scene' that was very competitive and quite cruel in many ways. It's taken me and Jane a while to settle in Manchester and this really helps us feel more content here. "Nine artists and collectives are exploring the miniscule as an artistic interface in video, networked and interactive installations, digital sound sculptures and photography, found objects and custom built environments." Sounds suitably arty so, being the scenester I am, I'll doubtless attend at some point (opening night tickets Joel?). 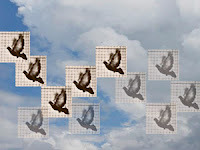 Joel has also developed an web application that tracks how many people have bluetooth enabled their mobile phones within his vicinity and represents this in real time as flying pigeons. He's a little surprised that Google aren't willing to fund extra development on this project. He's also GPS enabled his mobile phone so you can see exactly where he is. Rather him than me. Didn't make it to much yesterday. Just the 'The Chosen' in the lovely St Ann's Church in St Ann's Square. Described as "Arabic rhythms merge with jazz fusion to create a very intimate, sublime and contemplative sound". I guess that more or less sums it up. There was some very nice stuff in there for sure. It was their first gig and I think there was some nervousness which held them back a little. On the whole it was quite moving but some nervy playing and possibly some amplification issues detracted a little. The cello was mic'd up and occasionally sounded a bit muffled and plunky but generally sounded sweet. There was much use of looping which really has become popular with jazz musicians (in Manchester at least). Stuart McCallum uses looping extensively as does Neil Yates and I noticed Graeme Stephens using it a fair bit. The Line 6 DL4 seems to be the device to use. I used to really be into looping, being a big fan of Fripp and Eno and the whole frippertronics thing. I had to make do with very short echo times from my old Boss ME10 effects unit but you could get some great sounds by fading in chord or layering notes using a volume pedal. The fading in means you can't really here the start and end of the loop so you get a long sustained drone that you can play over. The long delay times you get now means you can easily sample and loop long sequences of chords and improvise over the loop. Tons more on this stuff at the long standing website 'Looper's Delight'. Reckon I should get back into this. Two gigs last night. Julian Argüelles as part of the fab Learn Live series of events and Jon Cervantes new outfit, Current Affairs. "informal talks by each of the featured artists in a relaxed and friendly venue. We wanted to create a place where you could hear great gigs from internationally performing artists and ask them about their lives, loves and music!" I've been to several of these now and found them really enjoyable and useful. They're normally held in the RNCM Students Union and the attendance has generally been quite low so I'm really hoping they can manage to keep them going. Surprisingly few students show up - most people seem to be usual MCR jazz mafia. This one was well attended however with the Jazz Festival publicity behind it. Julian covered some of the issues of jazz education. This has become a big business since the 1970s and he made the point that it can be a problem with students looking to be given everything and maybe not going and finding things out for themselves. he thn talked about improvisation. He stressed that many of his favorite players with the exception of Coltrane were not master technicians. It's great to have facility and technique but there's a danger it can get in the way of expression and feeling. Music isn't supposed to be a competitive sport. I then went over to Matt and Phreds to see Jons Current Affairs. It was quite Steve Coleman and very fusiony at times but there were some really good grooves in there. Quite liked the poetry style vocals. It's good to see Jon's finally got something together. We've met at jams many times over the last couple of years and played together briefly in a funk band, the Vibrant Family Collective. "The idea is an improv-jam night combining our backgrounds of jazz, contemporary classical and electro-acoustic music. In order to create a totally democratic evening, the way we're running it is; if you want to play, put your name in a hat at the start of the night, then ensembles are created at random by pulling, say, three names out at once (depending on how many people turn up and so on) and then you play for 10-15mins... Bring instruments, laptops, voices and toys!" I've got high hopes for this - reminds me of some of the amazing sounding nights that used to happen in Soho in the 50s and 60s that I've read about. Withington is very studenty and quite a young crowd so I'm hoping I don't feel too much the old git. I'll have to give it a try for sure. Day 3 of the Jazz Festival. Managed to take lunch early and catch 'The Magic Hat Ensemble' in St Ann's Square. So much magic was there that the rain even held off. On the whole it was fast bebopy stuff that's not so much to my taste but kinda fun live. Lots of complex fast riffs and dramatic tempo changes. Mostly standards I think but I missed the first 10 mins. The guitarist was using a big Gibson ES 175 style type thing. He picked every note though with the telegraph wire strings that some players use you can't do much else - can be a bit macho in a way. I prefer a bit more expression in the playing but he handled the fast runs incredibly well. Would leave me for dead I'm sure. Very sophisticated keys and all round impressive musicianship. I was feeling a bit weary and kinda sad yesterday morning (booze downer maybe) so didn't really feel like making the effort. Managed to drag myself out and fortunately day 2 of the MCR Jazz Festival didn't disappoint. It was in the foyer of the Bridgewater Hall and very well attended. First up was Lewis Wright, a quite amazing vibes player at only 19. How someone gets that good at that age is amazing. His own material was great and some good standards choices such as a couple of Chick Corea tracks made for a fab set. One to watch I guess. Wasn't sure about the next act, The Graeme Stephen Sextet in the first track or so but it drew me in after a bit. Very unusual guitar improv. The green Line 6 echo loop box the guitarist plonked on the floor is always a good sign. Not really sure what the hell he was doing but the force and tight timing in his playing made it work. Could have been unusual scales or free playing - prob mixture of both. As anyone who knows me knows, I'm a sucker for a good groove which they duly provided about half way in and that was good enough for me. Def worth checking out. A local fave, Neil Yates and his New Origins were up next. They seemed nervy and the first few songs lacked confidence and drive but they found their feet after 4 songs or so. New band members so to be expected. Another one of those celtic/folk/jazz fusion type things that makes me fear a Spinal Tap fiasco with druids, stonehenges and riversdancing but he made it work. There were definite jolly folky melodies in there but another tack he seemed to take was using fast celticy folk rhythmic figures with more jazzy chords and sequences. Worked for me as I bought the CD. Well it's been a long time since the last post - April last year. The world continues to go blogging mad and all things web 2.0. I have to confess to be quite taken with Facebook. I just wish I was a better typist - makes everything slow. Anyway, the Manchester Jazz Festival is on. Went to see my guitar mentor Mike Walker as part of the North West Real Book launch. An idea of our own John Ellis that actually happened. I think Mike found it pretty heavy going with all the sight reading of unfamiliar material but it seemed to go down pretty well. Submissions for the book were anonymous before judging so I wish I'd put a piece in. It may have had a chance of getting it in the book. Off to the second day a bit later which is a full one starting at 1pm. Looks like it'll be a good one and all indoors.